It seems like as soon as summer hits everybody starts talking about growing lavender, and for good reason! 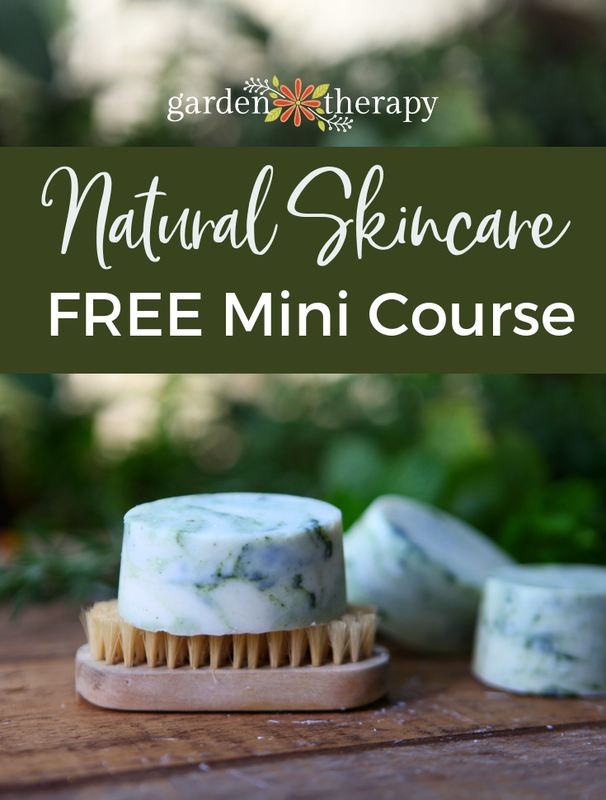 Lavender is a gorgeous ornamental with a dazzling fragrance, it has a wonderful delicate flavor that adds depth to many different types of recipes, and it is one of the most popular ingredients in natural beauty recipes and aromatherapy. All of that, plus it is hardy, drought resistant, beneficial to bees, and deer and rabbits leave it alone. 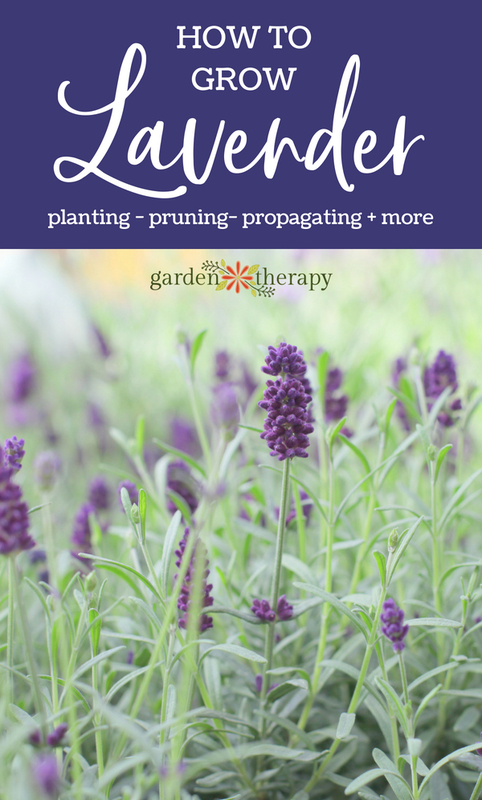 Lavender can be a bit tricky to grow and keep properly so that it is tidy and healthy, but this essential guide to growing lavender will provide you with a few tips that will help keep your lavender in top shape for years to come and the know-how you need to prune, propagate, and use this versatile garden staple. While there are many varietals in different sizes, scents, and colors, lavender plants fall into two main categories: English and Spanish. Easily identifiable by its gray-green leaves, long slim purple flower spikes, and breathtaking fragrance, English lavender comes in different shades of purple as well as white and pink varieties. It is actually native to the Mediterranean, but grows well in England’s climate, which is why we know it as “English lavender.” This is the type of lavender that is regularly used as a culinary ingredient (it is one of the herbs in the famous herbs de Provence mixture) as well as in aromatherapy and natural beauty recipes. With its silvery leaves and strongly scented flowers, it’s no wonder that Hidcote is the most popular variety for growing lavender in home gardens. Munstead is also no wallflower in the fragrance department, but the plant stays a bit more neat and tidy with a compact habit. Munstead lavender has the best flavor for cooking with. Small-space gardeners will love Thumbelina, a dainty beauty that grows only 12” tall and yet will bloom up to three times a season! 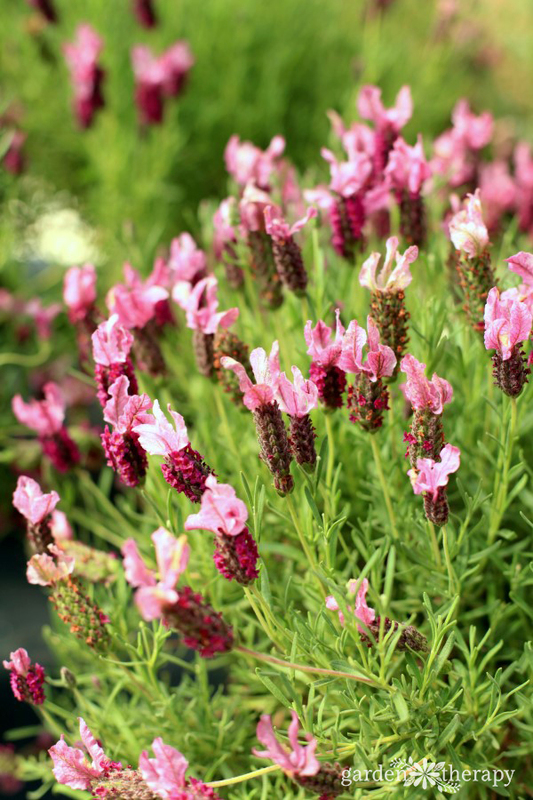 Spanish lavender can be identified by its slender leaves and plump, pineapple-shaped flower tops which are more pinkish-purple than most English lavender. Legend has it that Spanish lavender was used by ancient Romans to perfume their baths, but it is not commonly used for aromatherapy today. 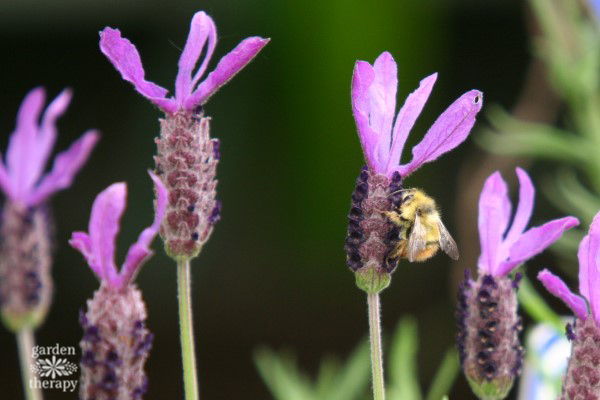 More often, Spanish lavender is planted as an ornamental and to attract bees. Bees prefer Spanish Lavender to English because its flowers are bigger and more open, which means it is easier to pollinate. Lavender is native to the Mediterranean, so it likes cool winters and hot, dry summers reminiscent of its native climate. It needs sandy, well-draining soil and full sun. Lavender is drought resistant and hardy to zone 7 or 8. Proper pruning keeps your plant healthy and neat and promotes growth, branching, and blooming. 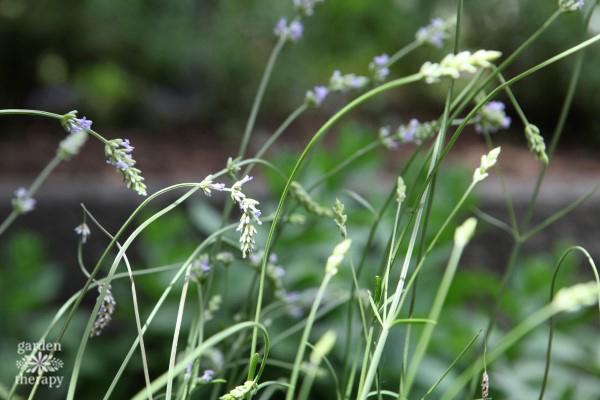 Lavender blooms on new stems, so pruning early or late in the season will be most beneficial. Start pruning in the second year after planting, and repeat each year after that. First, follow the 4 Ds of pruning. Then, you can cut back up to one third of the plant at a time, taking care not to cut into the woody stems. Pruning new growth promotes more new growth, whereas cutting into the woody stems will just cause those stems to die. and prune a third time in fall after the second round of flowers have finished. You don’t have to prune all three times, you can do it only once or twice a season if you want the plant to grow wilder and leave all of the flowers for the bees. It’s all about personal preference! 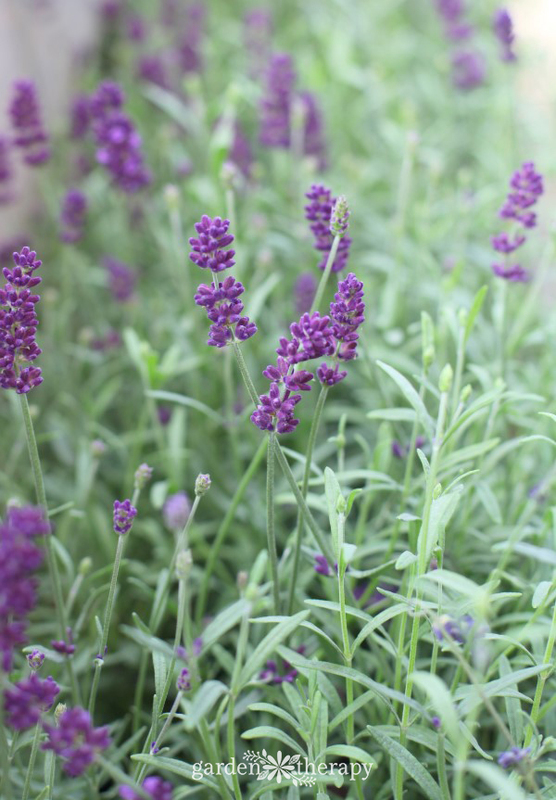 You can also harvest lavender buds for crafts and recipes. If you time it right, pruning and harvesting can be the same thing, but they can also be very different. The purpose of pruning is to maintain the shape of the plant, and harvesting is the act of removing the flower buds for another use. 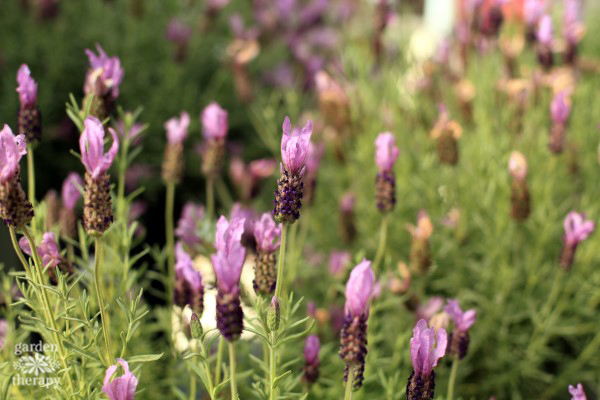 Spanish Lavender doesn’t require harvesting. 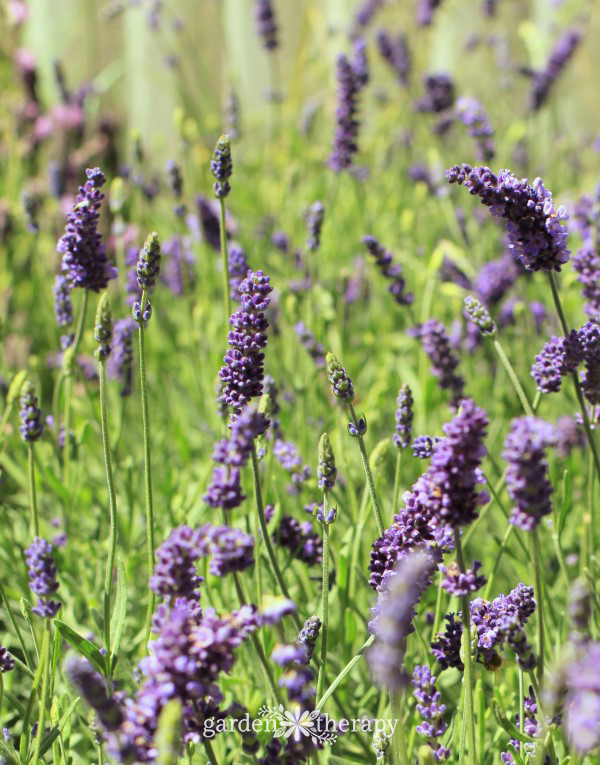 Head over to see How to Properly Harvest English Lavender in this article. 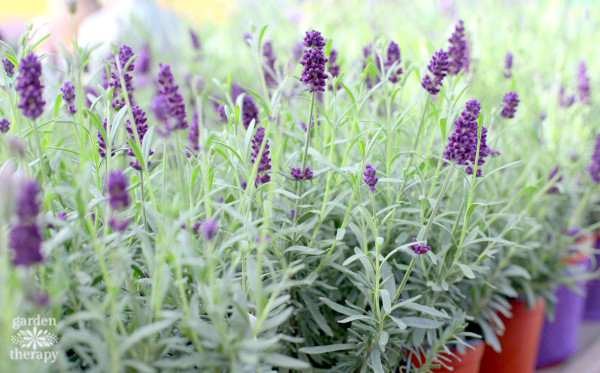 Growing lavender in bulk is easy when you know how to propagate. You can grow a garden full of lavender from just one plant by taking a cutting and rooting it following this technique. Using a sharp knife, cut a straight piece of stem with no flower buds on it. Cuttings should be about three to four inches long. Remove all of the leaves from the bottom two inches of the cutting, and scrape the skin off of the stem on one side of the bottom two inches with your knife. You can either dip the cutting in rooting hormone first to help encourage root growth, or else just plant it straight into a pot of good, well-draining soil. Lavender roots easily so root hormone is not necessary, but may help. Poke the cutting two inches deep and pack the soil lightly around it so that it stands up straight on its own. For a mini “greenhouse,” simply cover the cuttings with an upside-down plastic Ziploc bag. Place cuttings in a sunny spot and water when the soil feels dry. 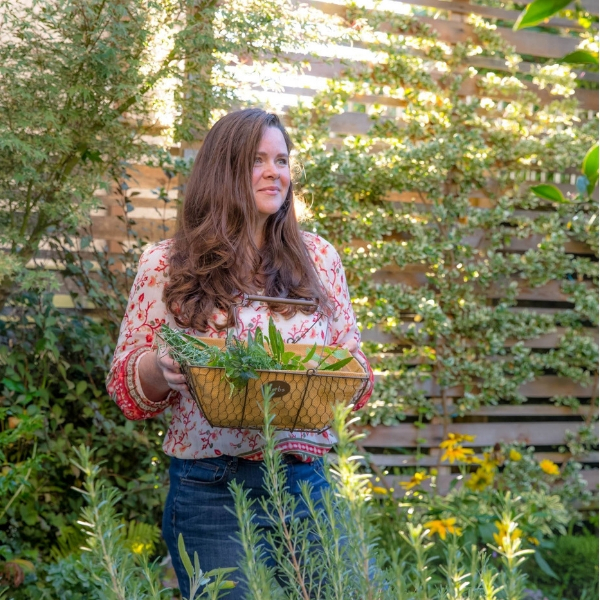 Learn more about propagating herbs here. After harvesting and, if you wish, preserving your lavender, there are a myriad of uses for it. Lavender can be used fresh or dried in floral arrangements, baking, cooking, and cocktail recipes, aromatherapy, and natural beauty recipes, and is a useful supply to have on hand for many crafts. Want to Know When to Prune? This Will Answer All of Your Questions! And for even more lavender, don’t miss these! What do I do if I was too aggressive with pruning and my lavenders are starting to die?